Home » Blog » How does an Infinity Pool Work? The first unique element of an infinity pool is that the water in an infinity pool goes up to the very top of the wall on one side. This helps to blur the line between the edge of the pool and the horizon. An infinity pool is sloped downwards towards the disappearing edge. This – combined with how the waterline meets the edge of the pool – causes a waterfall to pour down from the pool’s edge. The purpose of this is to create the illusion that water is flowing towards the horizon. But don’t worry – this water isn’t wasted; it’s caught in a catch basin and then pumped back into the pool to create an ever-flowing effect. This basin must be deep enough to catch all of the water that flows into it. In addition, it must have a beautiful design so that it doesn’t detract from the beauty of the pool. Infinity pools are built to reflect the sun. This reflection makes it harder to see the inner workings of the pool from above. It blurs the bottom of the pool and the disappearing edge so that the pool more seamlessly extends into the horizon. To create the most convincing illusion, you want the surface of the water to flow seamlessly and appear flat. Because of this, you need special pumps that can cycle the water without churning it. Furthermore, you want to avoid having bubblers, fountains, or other water features that will disrupt the surface of the water. The most important part of a vanishing-edge pool is the view. You want the pool to appear to extend into the sky or a nearby body of water. Because of this, it’s often best to situate the pool on a raised surface. You can have an infinity pool that extends into a forest or other location, but this won’t create quite the same visual effect. Regardless, your pool will still be breathtaking. It’s vital that you have your pool built by a reputable company if you want it to work right. Many elements can detract from the illusion and beauty of the pool if they’re not made correctly. For example, a basin that’s too small won’t be able to catch enough water. A basin that’s too deep, on the other hand, will cause too much water to drain from the pool, thus disrupting how well the water meets the vanishing edge. You must also have an autofill system to compensate for evaporating water. This must be balanced out by a leveling device that makes sure that there’s not too much water being pumped into the pool. In addition, the wall with the vanishing edge must have proper waterproofing in order to stand the test of time. These are just a few of the factors that may be messed up by a subpar pool contractor. 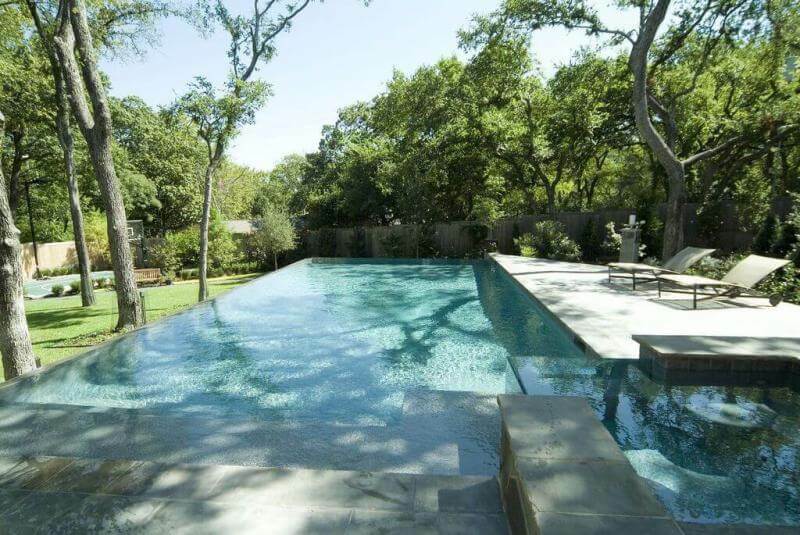 If you want your infinity pool built correctly, contact Summerhill Pools. They have all the proper licenses and certifications that any good pool company should have. In addition, they have a wealth of experience building beautiful infinity pools for homes and commercial buildings. Contact them today to learn more about adding an infinity pool to your home or commercial property.